Mixtrack, MIDI Control Surface for DJ from Numark. 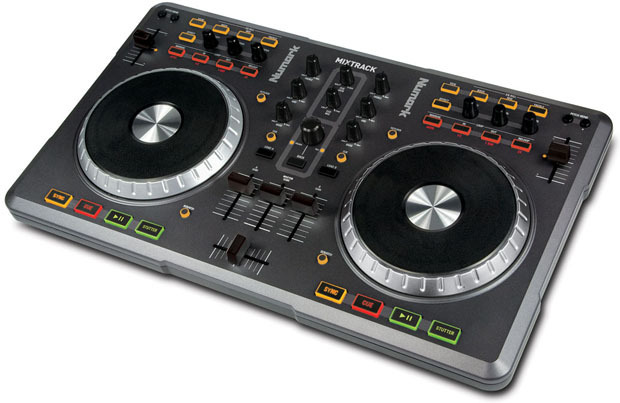 Mixtrack is a controller in a compact chassis for performing and producing with DJ software. 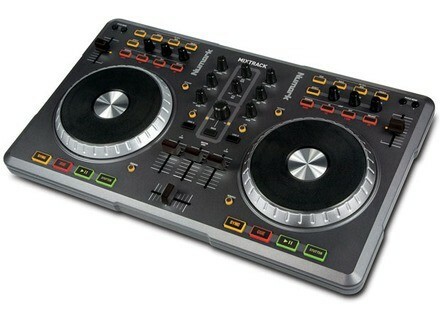 The layout works just like two decks and a mixer, designed to be portable so you can carry it and your laptop. Mixtrack has two deck controller sections with large touch-activated jog wheels and transports controls. The center of Mixtrack’s surface is its mixer section with a smooth crossfader, line faders, deck EQs, and more advanced controls for looping and effects. Mixtrack comes with Native Instruments Traktor LE software, which is based on Traktor Pro. This software is made for mixing, remixing, and producing music. It gives you four optional layouts, including cover art. It features new Beatgrid Editing and saving with locked sync for precise performance. Also included is manual looping and selectable loop length for flexible loop integration. Additionally, Traktor LE gives you several effects per deck including filter, delay, reverb and flanger. Mixtrack comes factory mapped for use not only with Traktor LE but also Traktor Pro and Duo. MIDI compliance means Mixtrack will also work with virtually any MIDI-mappable music software, Numark guarantees. Faderfox Midicontrollers go USB The 3rd generation of controllers brings new features like USB connection, better controls, access to four decks, access to four FX slots and more. Novation Dicer Dicer provides compact Cue Point and Looping control for the digital DJ. Vestax PDX-3000 MKII Vestax announced a new direct drive turntable, the PDX-3000 MKII.